Clematis can be grown as either a ground cover or a vine. If a vine is what you want, determine the type of support system you will provide and install it before planting. Clematis clings to the support with small petioles, so a wire-type support is preferred. Although spring is the ideal time to plant clematis, container plants can be placed in the ground in the fall with no damage to the vine. Plant the clematis in early September to give it enough time to establish before the cold weather sets in. Clear weeds, grass and rocks from a location that gets six hours of sun a day. If you live in an area with hot, sunny summers, provide the clematis afternoon shade. Prepare a 3-foot-wide area by digging up the top 24 inches of soil with a shovel. Add 8 inches of compost to the soil and mix it to a depth of 24 inches. Dig a planting hole that is three times the diameter of the clematis root-ball. It should be deep enough so that, when planted, the crown of the plant will sit 1 to 2 inches below the surface of the soil to encourage the growth of multiple stems, according to University of Iowa Extension. Place the clematis roots in the hole and backfill with soil. Press the soil lightly around the base of the plant. Cut the clematis stems to 12 inches long. 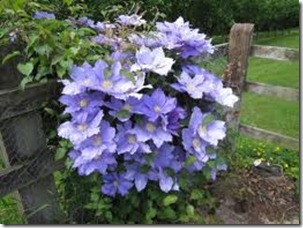 Water the clematis until the soil is saturated. Spread a 2-inch layer of mulch around the base of the clematis, 2 inches from the plant and spread out in a 1-foot radius around it. One week before the first hard freeze, add 2 to 3 additional inches of mulch. Clematis perform best when the base of the plant is shaded. Clematis vines can live for up to 25 years. You may need to train your young clematis vine up toward the support until the petioles begin to cling on their own.